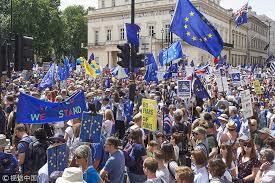 On 23rd June 100,000 people marched through London demanding the right to vote on the anti-working class Tory All-British or Unionist Exit deal. There were Scottish saltires and Welsh dragon flags but it was mainly an Anglo-European demonstration. In 2016 England voted by 15 million to 13 million to leave the EU. The Tories had fixed the outcome by denying millions of EU citizens, resident and paying taxes in the UK, their right to vote. Scotland and Northern Ireland voted to remain. The Tories and the Right seized the EU referendum to impose a Unionist British Exit on Scotland and Ireland. The Tory imposed Brexit proves to all doubters that the right of nations to self determination does not exist. It has led to a direct threat to the limited rights of the Scottish parliament. In the post-Brexit world the stability of the British Union depends on the centralisation of Crown powers in Whitehall. Those who niavely believe that Scotland will be allowed to hold a second Indie Refererendum are in for a nasty surprise. Crown, Parliament or People – who decides on the Tory Unionist Exit? We all have to make a choice. The Tory Deal has to be ratified by either the Crown or Parliament or the People (i.e. the people of the nations of England, Ireland. Scotland and Wales). The Crown intends to make its own homework and declare it the best possible deal. They do not want Westminster to have a “meaningful vote”. Take it or have something worse? Nobody should trust the Crown or Westminster with such a decision. That is what doing nothing means in practice. We, the people, have to take back control. This is why 100,000 were on the march. It is not going to stop there. 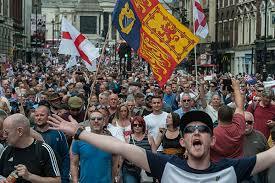 A week earlier nearly 20,000 Anglo-British fascists and UKIPers are also mobilising on a much bigger scale than ever before. They are ready to fight tooth and nail against a peoples vote. The Scottish people had had two referenda – on Scottish independnence and on membership of the EU. A majority voted to remain in the UK and in the EU. In the first case the British Crown was overjoyed that the Scottish people voted to stay in the UK. In the second the Crown decided to ignore Scotland’s democratic mandate and force Scotland to leave the EU in the name of Unionism. Should Scotland wait until May and the Tory government have imposed a Unionist Exit on Scotland? Or should Scotland fight for its right to self determination now in alliance with millions of democratic voices in England with the intention of derailing or deafeating Tory Unionist Brexit? The radical left in England, Ireland, Scotland and Wales must lead the fight for democracy and self national determination. RIC became the voice of the radical left in Scotland during the 2014 Scottish referendum. Now RIC must provide a lead in the new situation following the 2016 EU referendum. The siren calls of ‘Disaster Socialism’. There is a strand of anti-working class politics – ‘Disaster Socialism’ – which believes that the worse it gets for the working class the better it will be for socialism. The people need to be woken up by disaster and tradegy. An economoic recession, poverty starvation will ‘teach” the stupid workers to change and get rid of capitalism. “After Hitler comes to power” said the Stalinists. “it will be our turn”. A Unionist Exit from the EU will have distasterous economic and political consequences for working people in Scotland. But the idea that we should let it happen so that nationalists or socialists can pick up the pieces is a fundamental mistake. The struggle for Scotland’s right to hold IndieRef2 begins now. It begins with fighting to defeat Tory Unionist Exit before March 2019. It means ‘internationalism from below’ – working with democratic and working class forces in England by fight for a Peoples Vote on Tory Brexit Deal.